WORLDWIDE: Understanding the uncertainties in the energy yield estimation for a planned wind farm is crucial for project financing: the greater the uncertainties of the project, the lower the loan the developer can receive from a bank. The simplest and most obvious way to minimise uncertainty is to install as many meteorological masts as possible. A less costly and more pragmatic approach would be to install a few met masts wisely, but how do you know beforehand if you need one in the valley downwind of the ridge when you don't yet know if there are katabatic/downslope winds or recirculation on site? Accurate wind speed and shear readings can be captured at hub height, but as hub height met masts are expensive, developers will likely need a combination of met masts and LIDARs or SODAR radar systems. Whatever method is used, after combining the uncertainties and validating them against other project figures, can any actually guarantee energy yield? There are still many unknowns and inconsistencies in the industry approach to wind resource assessment, and we are still digging in the dark trying to understand what contributes to the uncertainties, identify them accurately and objectively find a way of assessing them. An International Electrotechnical Commission working group aims to provide a draft in early 2018 on standardising how to report and calculate energy yield, and define a loss and uncertainty framework for energy yield, wind resource and site suitability parameters. This will at least provide some answers. Meso-scale model simulations are already used as a data source for long-term correction of short-term local measurement campaigns for wind projects. They give time series of wind speeds and other meteorological parameters between distances of anything from three to hundreds of kilometres. And, just as weather forecasts delivered daily on television have become so much better at predicting the likelihood of rain, so too has meso-scale modelling improved, providing much more accurate energy yield estimations. Where 20 years ago, we were only able to look at details of a major storm, now we can see small thunderstorms or details of cold and warm fronts. Increased available computing power was the key driver, allowing more detailed models to run quicker, enhancing country weather prediction services as well as meso-scale based meteorological time series provided by independent wind resource or weather consultants. Open-source models have further helped, ensuring that scientists and users collaborate to update model and data accuracy and methods of data capture. And global measurement networks have become increasingly comprehensive, using the combined strength of satellite, buoy, met mast and rawinsondes radar data which is quickly communicated to global databases. Finally, easily accessible satellite data can now provide high quality global data sets for the terrain, so you can map the undulation of the land, note if there is a cornfield, a forest or a lake, consider how that may influence the wind, and plan the best site measurement campaign from your desk. In the last ten years, the average hourly/monthly wind speed correlations coefficients have improved from around 0.6/0.8 to 0.8/>0.9 today, and the meso-scale products are now so accurate that they are known as virtual met masts (VMMs). They are widely used for preliminary energy assessments and site prospecting and have occasionally been used as the sole wind data source for energy yield reports in project financing. So, are we now in an era where we no longer need site measurements, and can assess the wind resource remotely using virtual met mast data? I believe that for some projects and under certain conditions the answer can be yes. But there are conditions. Firstly not all virtual met mast data is of the same quality. Some VMM data are obtained directly from meso-scale models or meteorological reanalysis, some from coupling the meso-scale model/reanalysis time series with a micro-scale model such as Wasp, OpenWind or linearized or full CFD (computational fluid dynamics) codes. Where data points are 30 kilometres apart rather than 30 metres, and time intervals are in hours rather than minutes, validating the data is significantly more important. There are several ways to validate meso-scale models/VMM data and conclude the accuracy of your data. These vary from simply matching the VMM data against the real met mast - using statistical parameters as correlation, coefficient and bias - to the detailed versions that add validation against satellite data, country weather services and cross-predicted met masts, the latter which is called Round Robin. Using data from a real project as an example, the local met mast (MM1) measures wind speed at hub-height, the long term-adjusted (LTA) mean wind speed at MM1 is shown, above, in Figure 1 together with a normal distribution reflecting the measurement uncertainty. The hub-height wind speed from a VMM data set is around 4% above the LTA, clearly outside the acceptable measurement uncertainty range of MM1. Many validations of this kind would stop here, concluding that VMM wind speed data cannot be used as the bias between the virtual and the real met mast is too high. However, by going one step further and and adding the long-term adjustment uncertainty, the picture changes slightly, as shown in Figure 2. The uncertainty bands widen, but the virtual met mast wind speed is still outside the MM1 uncertainty range (just) and the validation again would state that VMM cannot be used as it is too far from the real met mast estimates. However, in a real wind farm we are not so much interested in the wind speed at a particular met mast, but rather at the various turbine positions at the site. 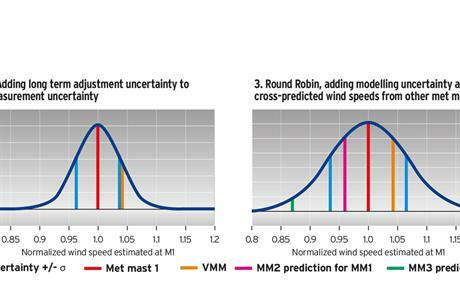 Since the extrapolation of wind conditions from one met mast to the planned turbine positions is typically done by a wind-flow model you need to incorporate the modelling uncertainty in your validation, which can be assessed by the Round Robin approach. This, in my view, is the better validation method. With more than one met mast on site, the Round Robin approach uses one met mast, say MM1, as a cameo for the validation turbine. Then using the wind speeds from the additional met masts at the site, as in Figure 3, cross-predict what these plus the standard wind flow model used would predict at cameo MM1. Then compare the cross-predicted wind speeds against the VMM data. Then, repeat the cross-prediction exercise, using the second and third met masts as cameos for a turbine: the modelling uncertainty of the standard wind flow model can be assessed by the cross-prediction errors and compared against the VMM performance (which originates from a model,too). Figure 3 shows that adding this information gives different insight. As both the second and third met mast underpredict the wind speed at MM1, the VMM becomes an equal and even slightly more accurate estimator of turbine cameo MM1 wind speed. Having completed this type of validation for several projects, we saw that the VMM data in the Round Robin perspective proved more accurate than our standard met mast plus micro-scale model approach. It should be noted however that some of the projects were outside of the micro-scale model operation limits in terms of terrain complexity and that the validation of CFD models in this perspective is still to follow. Having proven that VMMs can prove to be more effective than other campaigns, I believe that, for projects on simple terrain, in many cases one met mast, or even none, would be sufficient for assessment from a scientific perspective. This includes offshore projects. However, when the bank is the decider, or when you factor in that a met mast is a mere fraction of the worth of the project - for onshore projects certainly - it is likely that they will continue to be used. And with that investment made, the Round Robin approach takes advantage of both met mast and VMM methods, to give a superior validation for wind resource assessment. It would be a great benefit to the industry to maintain a set of Round Robin cases for blind validation of models that could be used by everybody, to validate the accuracy of numerical flow models and WRA approaches. If that were possible, I believe that wind resource assessments would become more accurate, and the banks would find it easier to finance projects, adding in some way to reducing the overall cost of wind energy.